The UK has a strong ambition to reduce green house gas emissions. In this short note, the government's ambition is compared to the actual green house gas emissions. It is great that the UK government have set concrete targets rather than just some vague intensions, so one can debate whether they are appropriate and check whether the targets are actually being met. Finding a good source of information is not trivial for a variety of reasons: some sources use tons of carbon, others tons of carbon dioxide, some targets are for five year intervals others are annual, and some targets are given as a percentage of other emissions, which may themselves be difficult to find. The Climate Change Act 2008 sets legal limits on the green house gas emissions for the UK and specifies a reduction of green house gases by 2050 of 80% relative to the emissions in the year 1990. For this purpose, green house gases are quantified in terms of Million Tons of CO2 equivalents, or MtCO2eq. There are several different gases which contribute to the green house effect, each with different potencies and different concentrations. Carbon dioxide has the largest effect (apart from water vapour, which can't easily be manipulated), and it is customary to translate other green house gases into equivalent amounts of carbon dioxide. In addition to the goal in 2050, the act also specifies some intermediate targets for the cumulative emissions in 5 year intervals. The first 5 year interval was start of 2008 until end of 2012. The target for each interval gets specified 12 years prior to the start of the interval. Currently, limits have been set for 2013-2017, 2018-2022, 2023-2027 and 2028-2032. 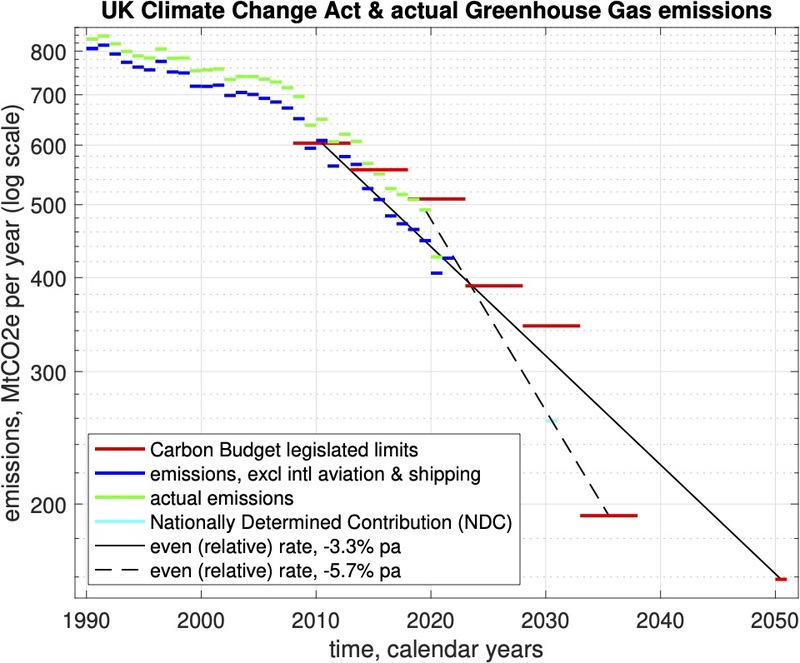 The UK emissions from 1990 together with the legislated limits are plotted above. The total limits for the five five year periods have been divided by five and plotted as constant levels over the entire period (although the requirement is only that limits hold on average). Note that the plot has a logarithmic axis for the emissions; this has been done so that the same relative reduction always has the same size on the plot. A straight line from the middle of the first interval to the middle of year 2050 has been superimposed, representing an even (relative) rate of decrease of 3.3% reduction per year. During both the first legislated interval 2008-2012 and the second interval 2013-2017 the actual emissions were below the limit set. Not all green house gas sources are included. Bizarrely, international maritime and aviation emissions are not included in the data although the damaging effects of green house gases don't depend on their source. Effects of international trade is not taken into account. Some countries do a lot of manufacturing and export goods. The current accounting system doesn't reflect this, and the average UK lifestyle may not be compatible with global emissions targets even if the national targets are met. Although the 2050 goal is ambitious, it is probably not enough. The target emission is around 160 million tons of CO2 per year, which is around 2.5 tons per person per year. The ability of the environment to absorb green house gases is difficult to estimate, but a global average emission of about 1 ton per person may be sustainable. So the same 3.2% reduction rate should probably be extended for another 30 years, until 2080 or so. The intermediate limits are all above the straight line corresponding to an even relative reduction. This corresponds to doing relatively less right now, and leave it up to whoever is in charge in the future, to do relatively more. Not sure how one would really justify such an attitude? But the actual emissions are slightly below the straight line, so we can only hope the future limits are set accordingly.